Well, some of you guessed it right on! 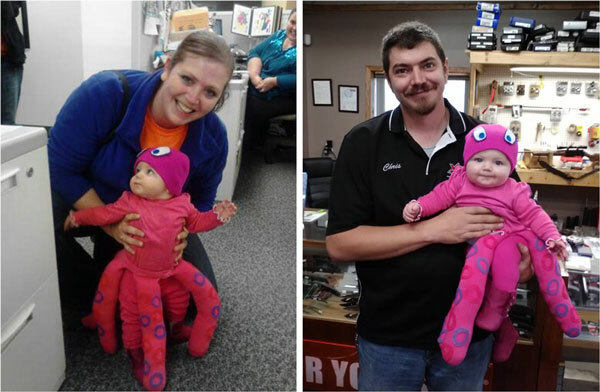 Emma as a wiggly little octopus this Halloween! And in true bad-blogger fashion, I didn’t take ONE SINGLE PICTURE of her costume while we were making it! Essentially, I knew she’d be going in-and-out of her carseat all day, so I wanted something that was easy to remove! I found white clothes and dyed them all pink. Her “legs” are adult socks that are stuffed and sewn onto a strip of fabric (actually a strip of one of her Daddy’s old t-shirts), that I stiched a small piece of velcro onto. Then I glued felt “O’s” that I cut out onto her arms and all her legs, and I glued felt eyes onto her hat. Bam, insta costume! 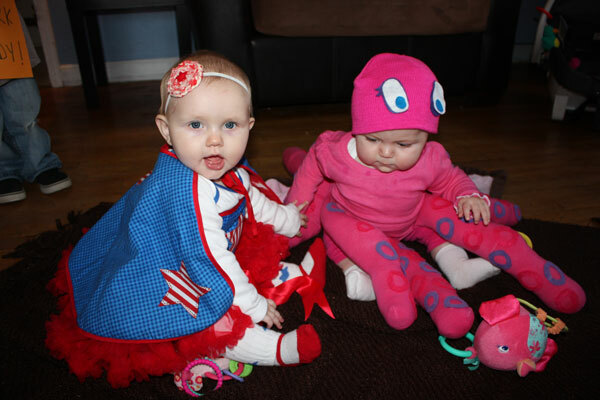 Emma loved all the attention that this pink creation brought on! 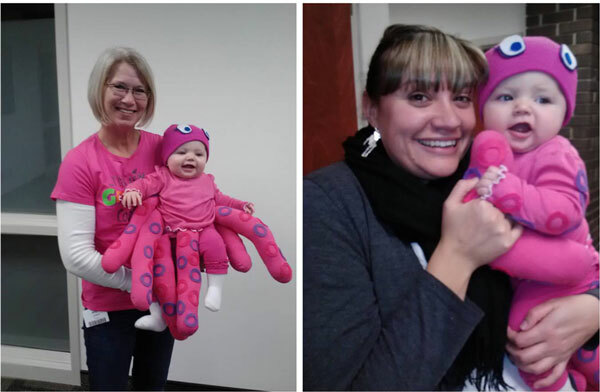 She went to visit Daddy at work, and then went to Mommy’s work to see Grandma and all Mommy’s coworkers! She certainly hammed it up! 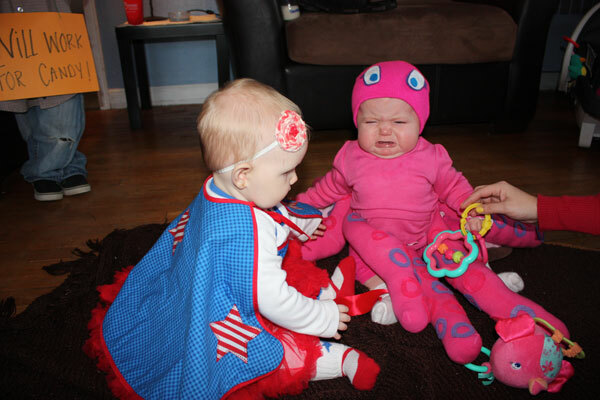 And then we went to a party at her daycare, she loved seeing all the kids dressed up – but was a little confused as to why… she would recognize them, but then make a funny face. She got lots of treats – mostly babyfood, and some chocolate for Mommy and Daddy – and then we decided to just hang out with her BFF Lauryn (Super Girl) for the rest of the afternoon. Everything was going great, and all of a sudden, Emma was DONE! She’d missed her afternoon nap with all the excitement and just needed to go home! So we let her get lots of sleep, and her smiles were all back after a little snooze! That’s our Halloween in a nutshell! How was yours?! Any great costumes? What was your favorite treat? 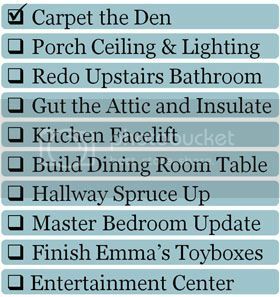 Did you go home feeling like Emma? See you next week! 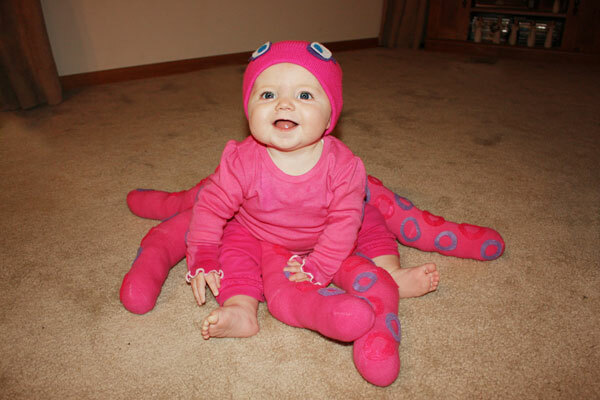 Great costume ~ Emma is so adorable & you did an awesome job making it. I think I felt like Emma’s reaction the day after I was out celebrating as Flo the Progressive girl.